For the next level in Reformer work, the Konnector® Reformer delivers an extraordinary experience: Studio Reformer® with Revo Footbar® plus the addition of the innovative Konnector rope system. Developed by and created in collaboration with Viktor Uygan of Konnect Pilates, the patented Konnector® makes Pilates more versatile (and fun) without changing it. The Konnector Reformer includes an innovative, single-rope pulley system with loops for all four limbs. Konnector enables independent, simultaneous movement of both arms and legs. You experience constant proprioceptive feedback through the single rope, facilitating full-body integration and stronger core activation in dynamic new ways. Exciting new functional movement possibilities moving all four limbs independently. Increases a client’s awareness of imbalances and asymmetries. Can perform all traditional Reformer repertoire. One-rope pulley system with loops for all four limbs. Tri Loops (4), also a collaboration between Viktor Uygan and Balanced Body, have a versatile third “hidden” loop to provide support for a full range of foot positions. Konnector is available as an add-on accessory for these Balanced Body Reformers. Installation on to the Reformer is required. 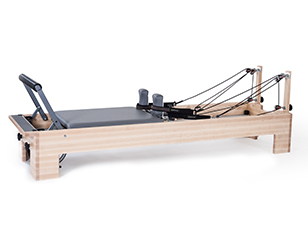 If you already have a Balanced Body Reformer, see Konnector add-on-kits here. Loops/handles: one pair each of single D-ring cotton loops and Neoprene handles. Standard or New York Sitting Box (your choice). Streaming Workout Video available: Balanced Body Education Director Nora St. John introduces key features of the Studio Reformer®, then guides you through an energizing, 67-minute Beginning/Intermediate workout. This video does not include Konnector-specific content. Please see our free Konnector podcasts for programming ideas. Choice of frame heights (14”, 18”, or 24”) (36cm, 46cm, or 61cm), to fit your workout needs. Extra-wide 7” (17.75cm) boards combined with fitted and joined frame and legs create an exceptionally sturdy, stable machine. A cut-out at the head of the Studio Reformer adds an extra 3.5” (8.9cm) of carriage travel in machines with risers. Carriage tracking system creates an ultra-smooth, virtually silent ride. Our 8-wheel system features four custom-built vertical wheels to support the carriage, and 4 adjustable sidewheels to guide the carriage smoothly down the track. Control the extension of the carriage with 5 carriage stops at head of the frame. Padded shoulder rests are sculpted for comfort, with posts that hold ropes off the floor. The Balanced Body TwistLock™ system lets you quickly adjust shoulder rests to 1” (2.5cm) wider spacing for larger clients, or remove them entirely to convert to a mat system. 3-position padded headrest for cervical support. Longest carriage travel in the industry – advantageous for jumping exercises. Maximum travel is 41” (104cm) in machines with risers. Konnector® single-rope pulley system includes four Tri Loops, which have a versatile third “hidden” loop to provide support for a full range of foot positions. Padded carriage, upholstered in heavy-duty vinyl. Choose from 42 custom colors. Balanced Body Signature Spring™ package includes 5 durable nickel-plated springs with tapered ends and swivel hooks, with provide up to 46 resistances. Standard configuration: 1 blue (light), 3 red (medium), 1 green (heavy). May be customized. Height: 14” (36cm). Can also choose heights of 18” (45.7cm) or 24” (61cm). Length: 93” (236cm) Stretch Studio Reformer is 99\” (251cm) in length. Carriage pad (pad only), not including head rest:Â length 30.5” (77.5cm), width 23” (58.4cm). 14” (36cm): Our standard height. Great for all exercises including standing work, and for facilities with low ceilings. 18” (46cm): Less bending for instructors when working with clients, and good accessibility for wheelchair transfers. 24” (61cm): Easiest working height for clinicians and manual therapy. Good for clients challenged by getting on and off a lower Reformer. More challenging for standing work. Konnector is compatible for these Balanced Body Reformers. Installation on the Reformer is required. It cannot be used, however, on a Reformer that has a Tower.